ATLANTA -- Charles "Jake" McLaughlin Jr., 87, of Atlanta died Wednesday, Aug. 25, 2004, at 7 p.m. at his home. Visitation will be from 1 to 2 p.m. Saturday at Quiram Funeral Home, Atlanta. A graveside service will follow at 2 p.m. at Atlanta Cemetery. Dennis Smith will officiate. Mr. McLaughlin was a farmer. He was born Sept. 8, 1916, at Middletown to Charles and Pauline Kattner McLaughlin. He married Annie L. Short on May 20, 1942, at St. Louis, Mo. She died June 16, 2002. He is survived by one daughter, Judy Hathhorn of Atlanta; one son, Glen (and Donna) McLaughlin of Atlanta; two grandchildren, Scott (and Wendy) McLaughlin of Oakwood and Lynette McLaughlin of Bloomington; three great-grandchildren; one brother, Walter McLaughlin of Lincoln; and one sister, Nellie Tlanda of Dallas, Texas. He was also preceded in death by one sister, two brothers and one grandson. He was a member of the Broadwell Christian Church and a former member of the Atlanta Rural Fire Department. He was a loving husband, father and grandfather and will be missed by all. Memorial contributions may be made to the Atlanta Rescue Squad or the Atlanta Fire Department. LINCOLN -- George W. Cress, 98, of Lincoln died Thursday, Aug. 26, 2004, at 1:02 a.m. at St. Clara's Manor in Lincoln. His funeral will be at 11 a.m. Monday at Zion Lutheran Church in Lincoln, with the Rev. Mark Carnahan and the Rev. William Adam officiating. Visitation will be one hour before the service. 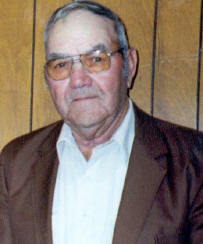 Mr. Cress was retired from farming from East Lincoln Township. He was born Jan. 11, 1906, in Strasburg to William and Lizzie Wirth Cress. He married Leona C. Dierker on Jan. 23, 1930, in Lincoln. She died Nov. 28, 2001. He was also preceded in death by his twin brother and two sisters. He was a member of Zion Lutheran Church and the Lutheran Laymen's League. Memorials may be made to the church or to Zion Lutheran School in Lincoln. Click here to send a note of condolence to the Cress family. MOUNT PULASKI -- E. D. Cates, 102, died Wednesday, Aug. 25, 2004, at 10:05 p.m. at Vonderlieth Living Center. His funeral will be at 11 a.m. Saturday at Fricke-Calvert-Schrader Funeral Home in Mount Pulaski, with the Rev. Douglas Cowan officiating. Visitation will be from 10 to 11 a.m. Saturday at the funeral home. Burial will be in Mount Pulaski Cemetery. Mr. Cates was a retired mechanic. He had worked for McWilliams Dredging Company and retired from Latham Implement Co. He was born Dec. 23, 1901, in Wayne County to John and Wilda Anderson Cates. He married Inez Lucille Hilliard in Decatur on July 5, 1926. She died Nov. 5, 1998. He is survived by one son, Dean (and Doris) Cates of Mount Pulaski; one daughter, Paula (and Loren) Anderson of Springfield; three grandchildren; five great-grandchildren and three step-great-grandchildren; and one sister, Florence Leathers of Geff. He was also preceded in death by an infant daughter, one brother, one sister and two grandsons, David and Daniel Cates. He was a member of Latham Baptist Church. Memorials may be made to the church or to Vonderlieth Living Center. LINCOLN -- Ruth L. Hinman, 93, of Lincoln died Monday, Aug. 23, 2004, at 3:05 p.m. at St. Clara's Manor. A private family service will be at 11 a.m. Tuesday, Aug. 31, at Holland and Barry Funeral Home, with Tom Gerdts officiating. Mrs. Hinman was a homemaker for her family. She was born Feb. 10, 1911, in Broadwell to Frederick G. and Helen C. Brown McGee. She married Frank W. Hinman on Nov. 5, 1932, at the First Christian parsonage in Lincoln. He died Dec. 18, 1985. She is survived by one son, Gary L. (and Sara) Hinman of Newport Coast, Calif.; a daughter-in-law, Marya Hinman of Lincoln; four grandchildren; three great-grandchildren; and three sisters, Louise Camel of Lincoln, Joyce (and Bill) Keyser of North Hollywood, Calif.; and Carol (and Eugene) Kodatt of Morton. She was also preceded in death by one son, Frank. She was a member of Lincoln Christian Church and a charter member of the Emblem Club. Memorials may be made to St. Clara's Manor Residents and Staff Fund. LINCOLN -- Mackenzie Elise Horn, infant daughter of Jason Horn and Brooke Johnson, was stillborn at 12:40 p.m. Tuesday, Aug. 24, 2004, at Abraham Lincoln Memorial Hospital. A graveside service will be at 10 a.m. Saturday at Evergreen Cemetery, Waynesville. Tony Billingsley will officiate. Surviving are her parents, of Lincoln; her paternal grandmother, Theresa J. (and Charles) Funk of Armington; her paternal grandfather, David (and Renee) Horn of Decatur; and her maternal grandmother, Donna Cole of Florida. Her maternal grandfather, Anthony Johnson, is deceased.